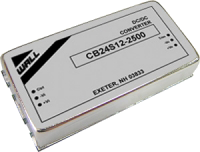 The CB series of DC/DC converters offers 30 Watts of output power in a 2 x 1 x 0.4 inch package. The CB series has a 2:1 wide input voltage range of 9-18VDC, 18-36VDC, or 36-75VDC. This series also offers single and dual output models. Some features include 1600VDC isolation, positive or negative remote on/off, and six-sided shielding. All models are short circuit, over voltage, over current, and over temperature protected. Heatsinks are also available, please call factory for ordering details. Dimensions: 2in. × 1in. × 0.4in. Notes: 1. MTBF: BELLCORE TR-NWT-000332. Case 1: 50% Stress, Temperature at 40°C (Ground fixed and controlled environment). MIL-STD-217F Notice2 @Ta=25°C, Full load (Ground, Benign, controlled environment). 3. 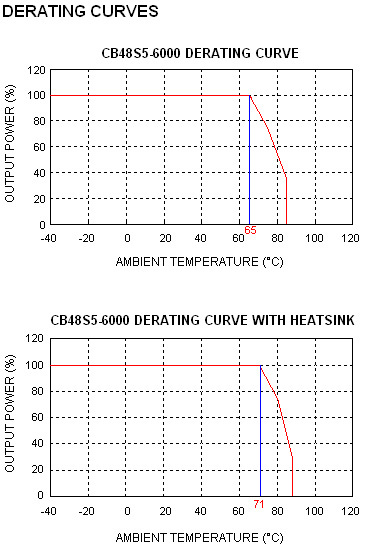 Heat sink is optional, consult factory for ordering details. 4. The CB series can meet EN55022 Class A with an external capacitor in parallel with the input pins. 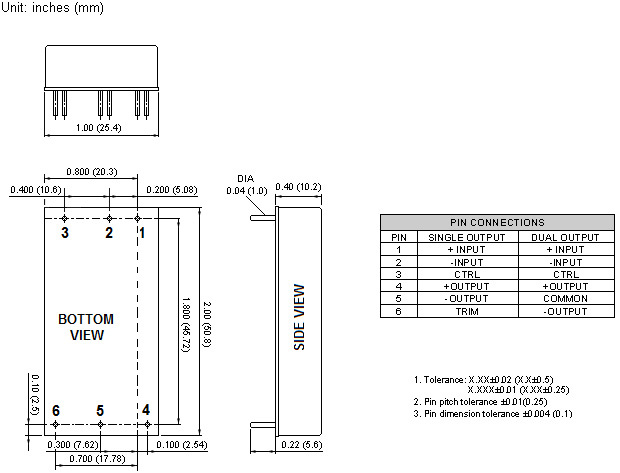 Recommended: For 12Vin: 10µF/25V X7R 1812 MLCC. For 24Vin: 4.7µF/50V X7R 1812 MLCC. For 48Vin: 2.2µF/100V X7R 1812 MLCC. 5. An external filter capacitor is required if the module has to meet EN61000-4-4, EN61000-4-5. The filter capacitor suggested: 12Vin & 24Vin Nippon chemi-con KY series, 330µF/50V, ESR 55MΩ. For 48Vin Nippon chemi-con KY series, 220µF/100V, ESR 48MΩ. 6. This product is listed to applicable standards and requirements by UL.